On May 18 Pennsylvania Governor Tom Wolf announced the selection of 114 projects to receive $25,143,294 in funding from the Department of Environmental Protection (DEP), for the protection of Pennsylvania’s water resources. The selected projects enhance watersheds, mitigate acid mine drainage, and support water pollution cleanup programs. The grant awards are made possible by the Growing Greener Grant Program, the largest single investment of state funds to address Pennsylvania’s environmental concerns. Funding for 42 conservation district projects was awarded to 29 different conservation districts. These grants equal $7,685,690 or approximately 31% of the total grants awarded. PACD received one grant for its engineering technical assistance program. Together, 37% of the funding was awarded to conservation districts and PACD. Click here for a full list of conservation district and PACD funded projects. For more information on Growing Greener, click here. 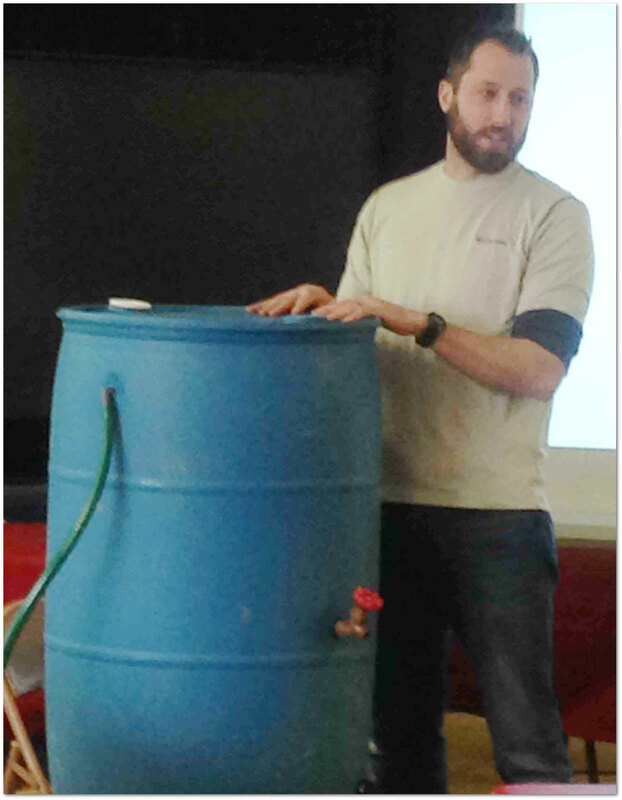 Trevor Weaver, Mifflin County Conservation District’s Outreach and Technical Assistant demonstrates how to build a rain barrel during the workshop held in Burnham on March 19, 2016. Another workshop was held in the Upper Kishacoquillas Creek Watershed in Belleville on March 22. Photo provided by Mifflin County Conservation District. The Mifflin County Conservation District held two successful rain barrel workshops in two impaired watersheds within Mifflin County. These workshops built awareness of local water quality issues with residential landowners. Financial and other support for this project is provided by the Pennsylvania Association of Conservation Districts, Inc. (PACD) through a grant from the Pennsylvania Department of Environmental Protection under Section 319 of the Clean Water Act, administered by the U.S. Environmental Protection Agency. 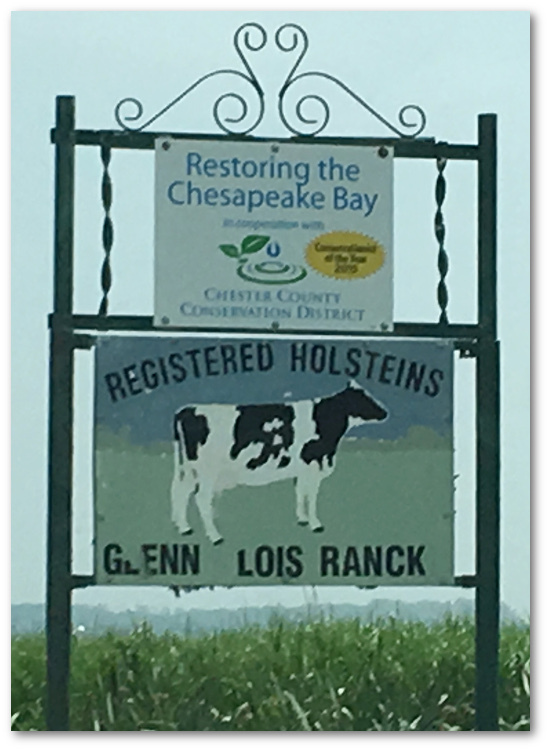 Recently, the Chester County Conservation District (CCCD) began recognizing farmers, organizations, businesses, and landowners who have demonstrated their commitment to protecting or improving the watersheds in which they live or operate. The intended goal is to incentivize good stewardship or farming practices by recognizing, with signage, those who not only meet all state and federal plan requirements, but who have also followed through and implemented those plans. By identifying which of the two major estuaries the recipient’s location drains to, the signs increase awareness and help make the connection to land practices and water quality. So if you are driving through Chester County, and you see one of these signs, you will not only be aware of what watershed you are in, but also the great stewards that work to protect and restore those watersheds. 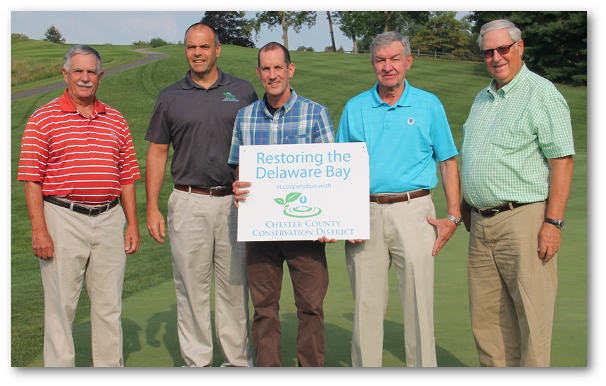 The Chester County Conservation District recognized the Kennett Square Golf and Country Club as Watershed Partners in the Delaware Bay. Pictured left to right: Pete Torras, Green Chairman Kennett Square Golf and Country Club, Christian E. Strohmaier, Managing Director, CCCD; Paul Stead, Superintendent, Kennett Square Golf and Country Club; Wayne Moore, President, Kennett Square Golf and Country Club, and Bill Fenstermacher, Kennett Square Golf and Country Club Green Committee Member. Photo provided by Chester County Conservation District. Planning is underway for the Annual Fall 102-105 Training Meeting for conservation district and DEP staff. This year’s meeting will be held October 25-27, 2016 at the Ramada Conference Center in State College, PA. Save the date and add this event to your calendar now. Click here for a DRAFT Training Agenda that has information on the topics that will be covered each day. This year Day 1 will focus on Agriculture, Day 2 on Chapter 102, and Day 3 on Chapter 105. Updates to the agenda will be available as session times are finalized, presenters are confirmed, and other details are worked out. A short session for new technicians (with 2 or less years’ experience) is scheduled at the beginning of each day to provide an overview of the programs to be discussed during that day. Note that on day 1 and 2 these sessions will take place before the general sessions begin. New technicians should plan to check-in at the registration desk early, before attending the session. PROJECT SPOTLIGHT: We are considering having table space available for districts and others to highlight projects and to share ideas and techniques. Tables will be available in the conference center lobby for your display (pictures, drawings, whatever) of projects relating to Chapters 102 and 105. Let me know if you are interested in sharing information on one (or more) of your projects and would like table space. Question or comments about the meeting can be directed to Jill Whitcomb at DEP, jiwhitcomb@pa.gov or 717-772-5668 or Terry Fisher at PACD, tfisher@pacd.org or 717-728-7223. The Berks County Conservation District (BCCD) held an Earth Day Celebration on April 22, 2016 for the public. The event was held as a fundraiser for their scholarship fund. Events included the annual tree seedling sale, “Backyard Basics” workshop, and “Paint the Rain” rain barrel painting event. 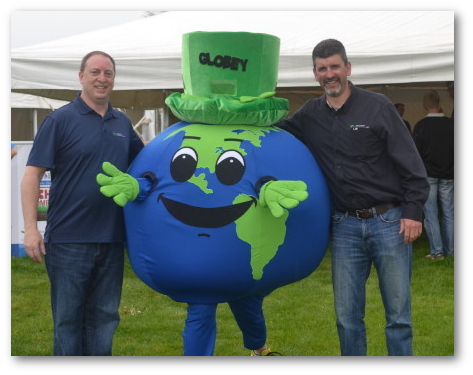 Berks Nature’s Globey visits the Berks County Earth Day Celebration. Pictured with Globey are BCCD’s Treasurer and Board of Director Brian Boyer (left) and BCCD’s District Executive Dean Druckenmiller (right). Photo used with permission from BCCD. 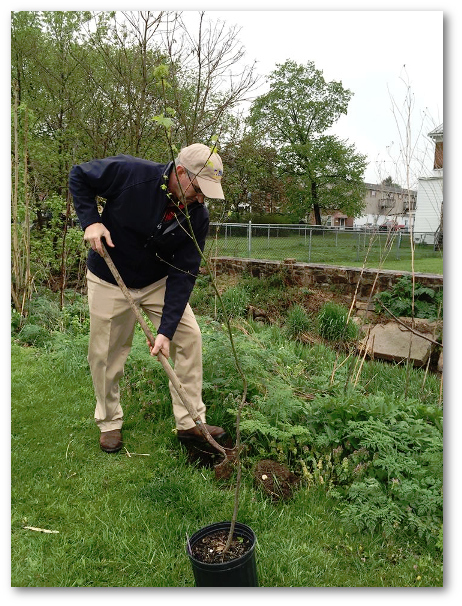 Secretary of Agriculture Russell Redding plants a tree along Little Lost Creek at Lost Creek Community Park in McAlisterville, PA during an Arbor Day planting event hosted by the Juniata County Conservation District and Juniata Watershed Alliance. Photo provided by Juniata County Conservation District. On April 29th, Juniata County Conservation District and the Juniata Watershed Alliance hosted a tree planting event at Lost Creek Community Park in McAlisterville. Forty trees and shrubs were planted throughout the park and on the banks of Little Lost Creek, which runs through the park property. The 40 trees planted this year were replacements for a planting done last year by the conservation district at the park via a sub-award from The Nature Conservancy, when over 400 trees and shrubs were planted at the park to replace dying ash trees and establish a streamside buffer along Little Lost Creek. This Arbor Day, Juniata Watershed Alliance volunteers, Department of Conservation and Natural Resources’ foresters, local Chesapeake Bay Foundation staff, and Juniata County Conservation District employees and directors were joined by PA Secretary of Agriculture Russell Redding, Deputy Secretary Hannah Smith-Brubaker, and Press Secretary Brandi Hunter-Davenport. The replacement trees and shrubs were planted within a couple of hours with everyone’s help. Before the event kicked off, Secretary Redding took a moment to thank everyone for the hard work they are doing to help restore the Lost Creek watershed. Juniata County Conservation District is currently working on several restoration efforts in the Lost Creek Watershed. A buffer workshop for small landowners will be held this fall thanks to a PACD mini-grant, and a large restoration project will take place over the next few years at the Lost Creek Golf Course, which was funded through a National Fish and Wildlife Foundation Chesapeake Bay Small Watersheds Grant. This Arbor Day tree planting will help restore a public section of Little Lost Creek and raise community awareness about the benefits of riparian buffers and other best management practices. Pictured are (Left to right): PACD South West Region Director Mike Price, PACD North West Region Director Clifford Lane, PACD Second Vice President Charles Duritsa, PACD President Glenn Seidel, PACD South Central Region Director John Akers, PACD First Vice President Donald Koontz, and PACD North Central Region Director Dr. Robert Shannon. The PACD Executive Board met in State College on May 3 to conduct their business meeting and to hear a presentation from PACD staff on the future direction of the association. In addition to the board members pictured above, PACD South East Region Director Piper Sherburne and PACD Secretary Kenneth Meck participated by conference call.